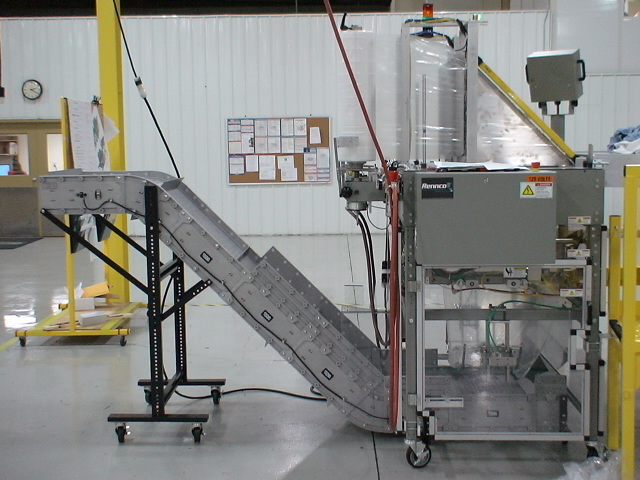 When Rennco, manufacturer of a full line of vertical packaging machinery and automated systems, needed a conveyor system to go with their new bagging system – the Vertic-L-PP – they did what they always do. They designed and built their own conveyor in order to provide a turnkey bagging system for their customers who launder a gamut of reusable items from bar towels to hospital gowns. Rennco built an 18” wide Z-Style conveyor to accompany their bagging system, but soon found that the quality of the conveyor was not up to the same standards as the bagging system. The flexible belt style conveyor had tracking issues and didn’t run smoothly. Conveyors are not our strong suit,” says Robin Thurgood, V.P. & General Manager at Rennco, Homer, Michigan. After contemplating the issue, Thurgood remembered a modular conveyor he had seen at a trade show. Thurgood contacted Dynamic Conveyor of Muskegon, Michigan. Dynamic Conveyor, manufacturers of the DynaCon® modular conveyor system, started providing a 24” wide Z-style conveyor to Rennco for use with their Vertic-L-PP bagging system. “The 24” wide conveyor gives us the flexibility to offer it with either our single or dual bagging system, which wasn’t possible with the 18” wide conveyor we were building in-house,” says Thurgood.